The regular version does not require granting permission, but it only works for feeds from your own server. Both are included. You can display many snapshot webcams on one webpage. They can be any sizes. 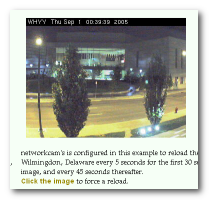 NetworkCam is configured in this example to reload the Times Square camera feed from New York City every 8 seconds for the first 32 seconds after you click the image and every minute thereafter. Click the image to force a reload. NetworkCam is configured in this example to reload the Vancouver Burrard Bridge camera feed from BC Canada, every 30 seconds for the first 2 minutes after you click the image and every 6 minutes thereafter. Click the image to force a reload. For this Applet to work, you must click grant/accept/always run on this site/I accept the risk to give it permission to talk to a variety of servers on the net. If you refuse to grant permission, the program may crash with an inscrutable stack dump on the console complaining about AccessController.checkPermission. This signed Java Applet needs 32-bit or 64-bit Java 1.8 or later. For best results use the latest 1.8.0_131 Java. If the above Applet appears to freeze-up, click Alt-Esc repeatedly to check for any buried permission dialog box. The testing frog sounds can be turned on and off by changing the HTML (Hypertext Markup Language). I thought they would make it clearer what the program is doing. You can also watch the Java console for a running commentary on what the program is doing. For more information read the NetworkCam manual. for the current version of NetworkCam. Applet to display a webcam or security camera image stream. 432K zip for NetworkCam Java source, compiled class files, jar and documentation to run on your own machine as an Applet. access networkcam source in repository with [Tortoise] Subversion client on wush.net/svn/mindprod/com/mindprod/networkcam/. download ASP PAD XML program description for the current version of NetworkCam. NetworkCam is free. Full source included. You may even include the source code, modified or unmodified in free/commercial open source/proprietary programs that you write and distribute. Non-military use only.